The Zebra Arbez Eo Ballpoint Pen 0.7 mm has an unusual body that is inspired by various modes of transport in London. The Arbez series from Zebra (arbreZ…the name is Zebra spelled backwards) is the company’s designer series which features pens designed by winners of a competition aimed at young new designers. The body of the pen has a toy-like look to it and has a weird half oval shape (one size is flat and the rest of the pen is rounded; think of an elongated “D”) which has been suggested is to resemble a Tube tunnel. I have a normal grip but I generally don’t care pens that dictate how I should hold them. Based on the design of the pen and where the branding is, this pen should be held with your index finger resting on the flat portion of the barrel. I don’t find the barrel to be uncomfortable but I don’t want to waste brain cycles thinking about how to hold a ballpoint pen. 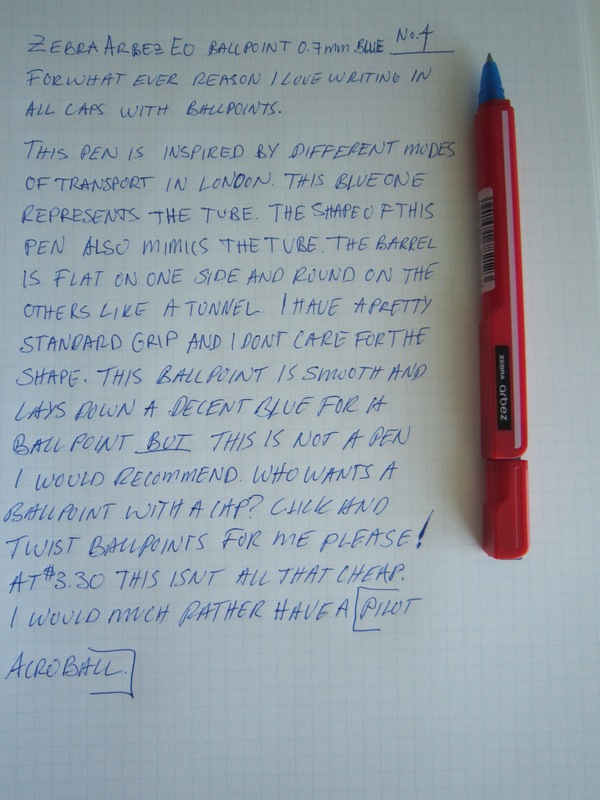 The ballpoint writes smoothly but is not as nice as some other less expensive ballpoints like the Pilot Acroball. Also I don’t like that this pen has a cap. Ballpoints don’t need a cap and I would prefer not to deal with one if I don’t have to. If you love the design or simply want a conversation piece then it may be worth shelling out the $3.30 the Zebra Arbez Eo Ballpoint.